iii. Arthur Sherman Bigelow, b 1860, d 29 Apr 1894, Harvard, MA (drowned in Bear Hill Pond), m 27 Dec 1888, Harvard, MA, Katherine Maria Dickson, daughter of Walter Dickson and Catherine Houghton. She was b 1864 and d 15 Oct 1946, Harvard, MA. 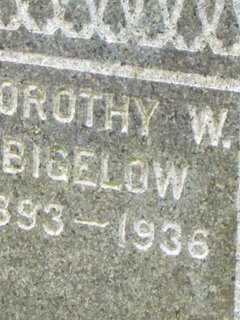 Both Arthur and Katherine are buried in Bellevue Cemetery, Harvard, MA, Sec E, Lot 2.
i. Harold Dickson Bigelow, b 09 Feb 1890, Harvard, MA, d 04 Jun 1948, Harvard, MA, m (1) 30 Aug 1919, Harvard, MA, Evelyn Holbrook Farnsworth. She was b 1890, d 01 May 1920, Harvard, MA. Harold m (2) 26 Jul 1945, Harvard, MA, Helen Emogene Stone. She was b 22 Apr 1887, Harvard, MA, d 31 Oct 1964, Harvard, MA. 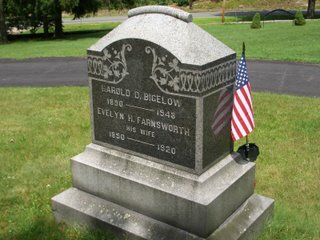 Both Harold and Evelyn are buried in Bellevue Cemetery, Harvard, MA, Sec E, Lot 2. 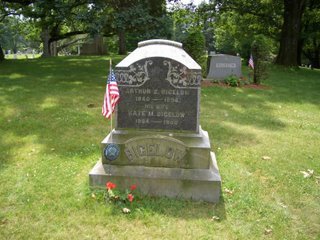 Helen is also buried in Bellevue Cemetery, Harvard, MA. ii. Dorothy Whitcomb Bigelow, b 1893, d 29 Sep 1936, Harvard, MA. She is buried in Bellevue Cemetery, Harvard, MA, Sec E, Lot 2.